We have quite a few Star Wars fans here at Pivot Point, so when Dan from Atlanta called looking for fasteners for his R2-D2 replica, we were happy to oblige. Dan is a member of the R2-D2 builders club and is building his own “functioning” replica. Started originally in 1999 as a Yahoo users group, the club has now grown to thousands of users around the world. The Club is a non-profit organization of Star Wars fans that enjoy building robots. And the best part is they don’t just build R2’s. They build LOTS OF COOL other Star Wars replicas. 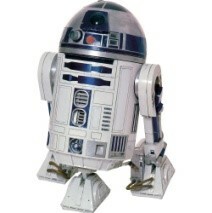 The “skin” of R2D2 is metal, covers the mechanics inside and makes R2 look like R2. However, fastening the skin to the frame was a challenge. Strong magnets would work well, but they interfere with the sensitive electronics inside. Bolt, nuts or screws are too tedious, and are not well suited to some of the tight spaces and limited access. Dan discovered our Pull Pins, which work perfectly as a quick release mechanism to attach and detach the skin. The force is strong in these quick release fasteners! And don’t forget, Rogue One: A Star Wars Story is now open in theatres world-wide!